Team Chainsaw got an early start cutting more trees. One tree that we cut, the top end slid down the slope so where one tree blocked the trail, we ended up creating two trees blocking the trail which amused me to no end. "Are we trying to make the trail worse than we left it?" But it was such a large log, it easier to handle the two halves separately, and eventually we got both parts off the trail. For all the effort it entailed, though, it was a little disappointing to count it as one tree. Our next challenge had two parallel trees blocking the trail, not more than one or two feet apart from each other. It was a tale of two trees. One was smooth having lost its bark years before but dug deeply into the trail when it fell, burying the end of it surprisingly deep. The other tree was still rough with bark, but managed to fall without burying itself into the trail. Both trees were fairly large--perhaps a foot-and-a-half in diameter. Definitely too big for a Corona handsaw, and definitely too big and heavy to push off the trail. A closer examination of the tree at the top of the slope showed that neither of them were actually attached to anything, although the smooth tree was resting on some of the branches of the rough-barked tree that seemed to hold it in place, as if they were in a dance and entwined when they fell. I wasn't entirely sure how to handle this little mess. Cutting with a cross-cut saw would be difficult because each tree got in the other tree's way. Larry went to work digging up the trail where the smooth tree embedded itself, and I went to work cutting off the limbs and stobs from both logs. I'm not sure which if us had the more difficult job, but Larry finished before I did and started helping out with the stobs. The smooth tree I felt we had a good shot at pushing down the slope if we could only dig it out enough from where it buried itself in the trail, then the rough-barked tree would be easy to cut. That was my working theory, at least, but to have any chance of sliding the tree very far, we needed to cut off every stob and branch that would help hold it in place, including the ones underneath it. It caused some awkward moments, trying to get the small handsaw around and under the tree while trying to avoid sliding down the steep slope ourselves. Wassa Jr. hangs out in my new pack. A half hour later, we were able to wiggle the smooth tree, but found a few more stobs that we hadn't been able to see until then and stopped to cut those off as well. From the top of the slope, where I worked, the log still looked pretty embedded into the trail so I was skeptical when Larry said it was time to push it off the trail. "It's not going to happen," I told him confidently. Larry and Marcella stood back, and I found a place where I could try to push the log with my legs, and I'll be darned, but that tree took off like a rocket shooting down the hillside at a terrific speed. A hundred feet down the slope, a couple of fallen trees blocked the route and I waited for the inevitable collision and crash as our log shot into the debris, but the log bounced just enough that the tip went over the resting logs and shot the log into the air like a skier off a ramp. The momentum of the log pushed it completely over the debris pile, arched through the air, and continued sliding down the mountain until it hit a flatter area and slowed down, finally crashing into other fallen logs. Larry and I got pretty excited about all this. "Yes! Now that's what I'm talking about!" The massive log we pushed barely looked larger than a toothpick now, so far down slope. It appeared to have cracked in the middle at some point--it was definitely not straight an an arrow anymore. My one regret--I got absolutely none of it on video. I really didn't think that log was going to go very far. The rough-barked tree wasn't going to slide so easily--the bark was much too rough to glide across the ground like the log that didn't have the bark on it anymore--but Larry wanted to try pushing it anyhow. With the other tree out of the way, it was much more accessible than before, and we cut off a few more stobs that revealed themselves with the removal of the first tree. Then both Larry and I got behind it and started pushing, and by golly, he was right again. The tree started to slide a little, then it got stuck, the uphill end hanging in mid-air. My feet lost their grip and slid off the tree, and I slid down the slope under the overhanging tree--not a good position to be in. Larry still had his feet securely on the tree, though, and I managed to scrambled back up and out of the danger zone without any trouble. Whew. That was a little scary. of the group I ran into at Junction Lake. The tree was so close to sliding down the hill, though, and we gave it another shove. It slid a little more and got hung up on the rough bark again. We gave it another shove and this time, it took off, shooting down the mountain at a high velocity. This tree crashed down the hillside a bit less gracefully, stopping near the first pile of debris that I thought would mark the end of the first tree's run. Another fantastic crash! And once again, I got absolutely none of it on video. "Why is it," I asked Marcella and Larry, "when I take a video, the trees don't go very far, but when I don't take a video, it does that?!" I also wondered about how we should count those tree. Our standard, so far, had been to count any tree blocking the trail that we could free without cutting the main trunk of the tree as a "half tree," so technically speaking, both of these logs should have been counted as half trees. But the amount of preparation involved to get these out was enormous. Digging the one tree out from where it buried itself it the trail and cutting off several dozen branches and stobs was no quick or easy task. Most of the trees we had cut didn't require as much work or effort as the prep work that went into these trees, so we made an exception to our rule and counted both trees as full trees. Marcella worked on rebuilding the trail. After Larry dug out the first tree, and both trees scraping across the trail, the trail now had an enormous pit in it. A certifiable wreck. We now had to fix the trail from the damage we inflicted onto it. Joanna's ready to do some logging! We headed down trail to look for more trees blocking the trail and ran into Gary and his helpers another five or ten minutes down the trail, telling him that all of the trees above us are done--except the ones that other teams are already working on. He told us that all of the trees below them were done. "Yeah, there aren't anymore trees blocking the trail. Except that one that fell overnight near the avalanche chute at near Leamh Meadows." It wasn't even noon yet, though, and we didn't have anymore trees to cut off the trail. We were a little disappointed. In all, Team Buzzsaw cleared the trail of 17 1/2 trees for the duration of our trip, out of the estimated 80 or so that were blocking the trail. The others said that the only tree left blocking the trail was that one by the avalanche chute, but John said he didn't see it--but he camped at a climbers campsite near there the night before and must have missed it. and along the sides of the trail. After lunch, John continued up the trail--he intended to go over the top, through all the snow and down to Waptus Lake. The rest of us continued down the trail planning to do some other trail maintenance along the way. Larry ran off with the grub-hoe, widening the trail where necessary while Marcella and I wound up near the back of the pack pulling out saplings from the side of the trail before they could grow into something whose branches would start blocking the trail and using loppers to cut back vine maple and pines already overgrowing sections of the trail. Marcella eventually went a little ways ahead, pulling out saplings while I did the lopping. I grabbed the loppers to cut some branches overhanging the trail--hikers would have no trouble getting under them, but anyone riding a horse would have had problems, so I'd scramble up as high was I could on the uphill side of the slope, stretch out my arms as high above me as I could with the loppers, and cut the branches as high up as I could reach. I kind of assumed Marcella wasn't that far away, but after a half hour or so, I started wondering what happened to her. I figured I'd catch up quickly enough, though, and started skipping some areas and lopping only the worst areas. 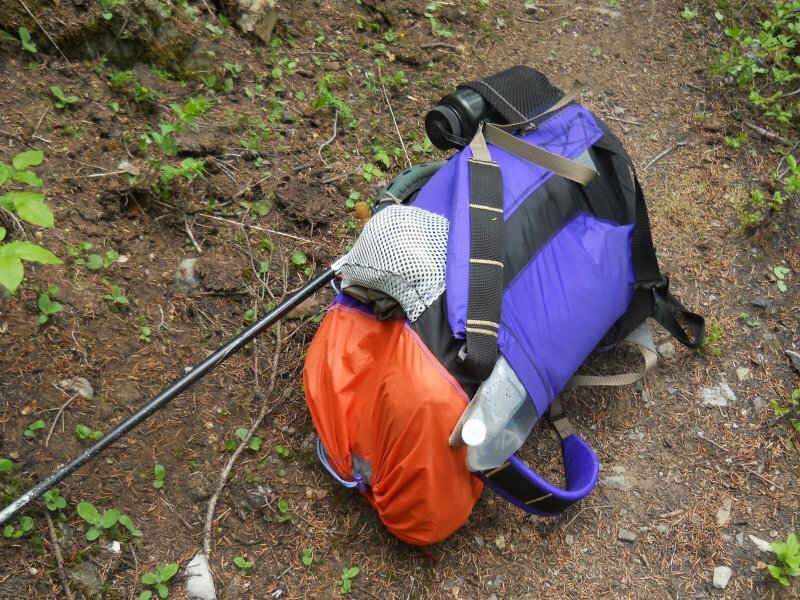 I had it down to a science--I didn't even have to take off my pack. I'd cut the branches directly above my head--it didn't matter if they fell and hit my head since I had a hardhat on. 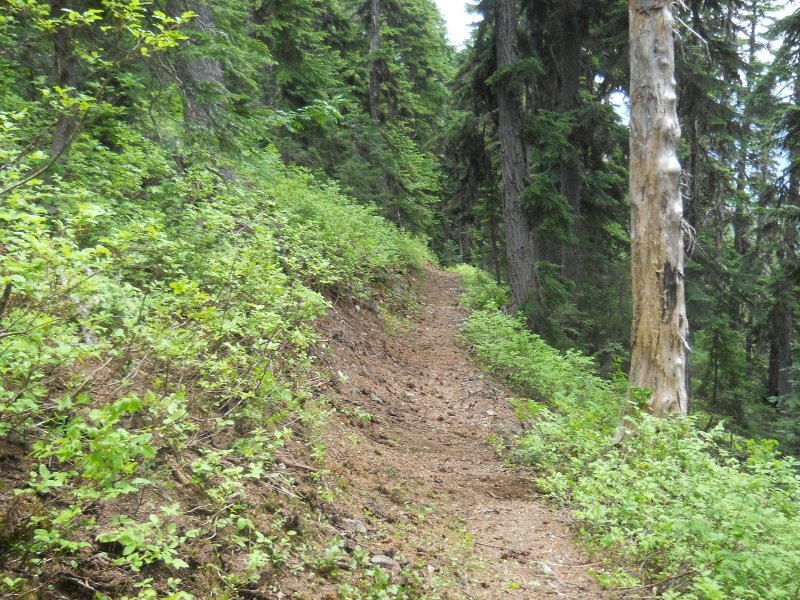 I'd cut down a lot of the branches, shove the whole mess off the trail with my feet, then go down the slope to the next problem area. 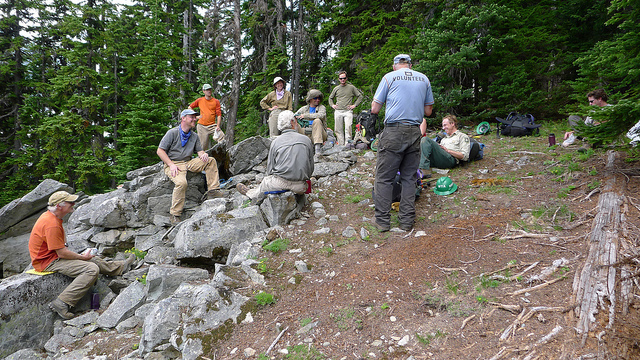 The plan, I knew, was for everyone to get down to Lemah Meadows where we'd set up camp by around 5:00 that evening. A little after 4:00, I figured I was still an hour away from camp, so it was basically time to stop working. After working non-stop for over three hours, though, I was a little tired and sat down to take a quick rest. And that's when I noticed it was missing. Wassa Jr. I had him in the back of my pack, in a mesh pocket, with his head and arms sticking out, but he wasn't there anymore. Shoot! I knew immediately what must have happened. I was cutting those branches above my head, letting them hit me in the head and slide down my back. One of them must have hooked onto Wassa and pulled him out. Buried in all the branches, I probably couldn't see him and I kicked him off the trail along with all of the other branches. 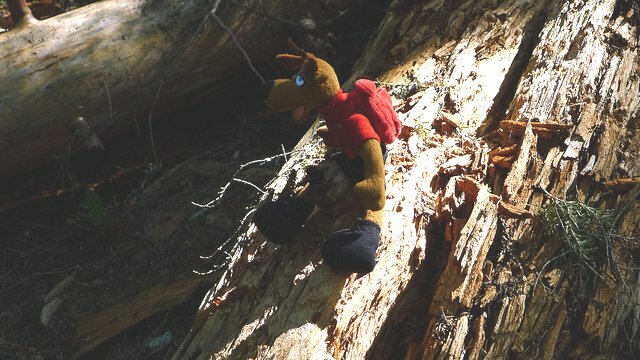 I know I didn't leave him on the trail--I always checked the trail before I left any area where I worked to make sure the trail was debris. He had to have been mixed in those those branches I kicked off the trail, and I could have lost him at any point in the previous three hours or so. ShootShootShoot! I decided I'd backtrack one full mile and search for Wassa. If I found him, great, if I didn't.... I'll make a little cross for him on the trail. There was no sense carrying my full pack back up the trail just to take it down again, so I left my pack in the trail. I also scribbled out a quick note in case anyone else tried to go back up to find me--so if they reached my pack, they knew where I was and when I planned to be back. 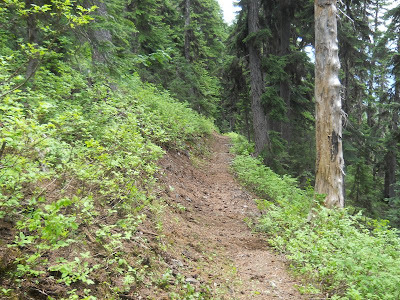 Without a pack on, I practically ran up the trail, only slowing down when I saw piles of freshly cut branches off the side of the trail. I would kick the branches around a bit hoping to see Wassa fall out. I particularly kept my eyes open for anything red. Wassa's red shirt should be a beacon in the sea of greenery. After 25 minutes, when I figured I should have covered a full mile, I had failed. I looked up the trail, tempted to keep up the search, but the note I left at my pack said I'd be back at my pack by 5:00. I wouldn't even make it to camp until closer to 6:00--a full hour later than we were supposed to. No, it was time to give up the hunt and turn back. "Goodbye, little buddy," I said to the trees. "Wherever you are, I'm gonna miss you." You'd think I lost a living, breathing pet, and I didn't even realize my attachment to that little toy until he was gone. "I should have known you'd ditch me for the forests of the Pacific Northwest," I told him. "This is your home, after all." I turned back down the trail and started down. I still kept my eyes open for him on the trek back to my pack--hoping that I somehow missed him on my way up--but I knew in my heart that he was further up the mountain than I could search and that I was now walking away from him. That last shred of hope vanished when I finally went around a switchback and reached my pack. Wassa Jr. was gone. My note was still with my pack--nobody had come to check up on me (at least not this far up the trail). I crumpled up the note, hefted the pack back on, and went down to camp. At camp, everyone welcomed me back, and I broke the bad news about losing Wassa. I don't think they were quite as upset about it as I was, but they did seem genuinely sad about it. I would set up Wassa each time we worked on trees to "observe" us--he was our supervisor, or at least like to pretend that he was. Many had even taken photos of Wassa in action. YOU LOST WASSA JR??????? You are a bad, bad, bad man!!! I felt a great disturbance in the Force, as if millions of voices suddenly cried out in terror and were suddenly silenced. Or perhaps it was a single stuffed moose, I can never tell the difference. I fear something terrible has happened. Free at last! Free at last! I finally ditched that weird wacko who has dragged me all over the "civilized" world. Back to nature. Muaaaaahhhhhaaaaaaaaahhhhaaaaaaa!